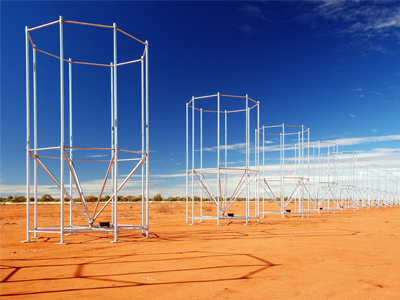 The High Frequency Radar branch of National Security and ISR Division maximises Australia's major investment in long-range over-the-horizon radar through the application and transition to service of advanced science and technology. The research program is based on four principles: applied research, sophisticated experimentation, collaboration, and transition-to-service. The branch conducts applied research in several disciplines including HF skywave, surface-wave, line-of-sight radar, HF radar Electronic Intelligence (ELINT), and VHF wide-field surveillance radar. This work is supported by a comprehensive experimental program underpinned by the in-house development of specialised HF and VHF radar components and systems, theoretical analysis and modelling and simulation. Our Radar Technology and Systems group develops and fields specialised HF/VHF radar components and sub-systems for understanding radar component behaviour, understanding the connection between component and system performance and for the wider experimental program. Equipment and radar components developed within this group are routinely commercialised through local industry partners. Our Signal Processing and Propagation group conducts research in signal and array processing, cognitive radar, coordinate registration and algorithms and computing architectures for real-time processing. This work is key to the transfer of new ideas to new capabilities on the operational radars. This is achieved using a proven transition path beginning with research and moving from experimental demonstrators, to technical demonstrators, to operational demonstrators and finally assisting industry in establishing supported operational capability. Our Geophyiscal Phenomenology and Performance Assessments group is concerned with all facets of support and intelligence in relation to HF radar. These include radar parameter advice, propagation modelling, network and radar level system modelling, target and antenna modelling, electronic intelligence functions exploiting our wider radar and propagation knowledge, and performance assessment. The work of this group is underpinned by basic research in ionospheric physics.